Gallois has a good track record in industry and as a civil servant. PARIS -- PSA/Peugeot-Citroen's board has selected ex-Airbus Group CEO Louis Gallois as its next chairman as the carmaker prepares for a 3 billion euro ($4.2 billion) tie-up with China's Dongfeng Motor Group. 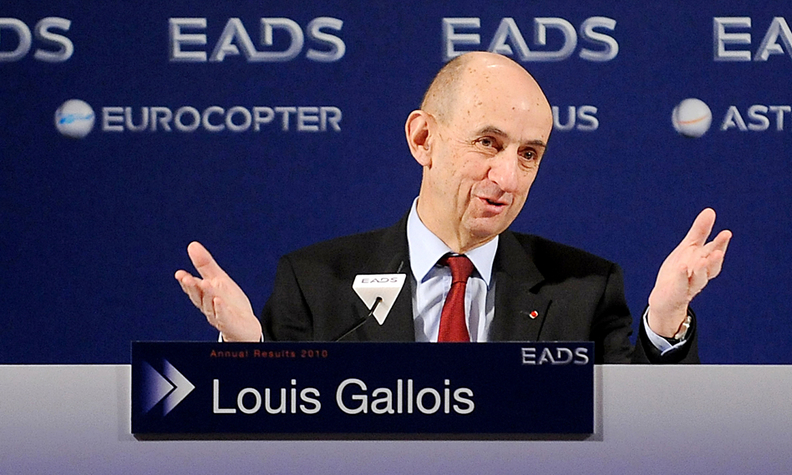 Gallois, 70, will succeed Thierry Peugeot as the first chairman outside the carmaker's founding family. By selecting Gallois as chairman, PSA's board members chose a well-connected official with the current Socialist-led French government weeks before the automaker sells a 14 percent stake to the state. Gallois will need to use his diplomatic skills to deal with the two other main shareholders, Dongfeng and the Peugeot family, which will also each own a 14 percent holding. Gallois has served on the PSA board since late 2012, when his appointment as a nominal independent was imposed on the company by President Francois Hollande's government in return for 7 billion euros in state loan guarantees. His nomination will be submitted for formal approval by the carmaker’s annual shareholders meeting on April 25, PSA said in a statement today. Gallois' appointment is part of a broader governance reorganization that will result in the Peugeot family’s board seats being reduced to two from four. Thierry Peugeot and his cousin Robert are expected to remain on the board to take the founding family’s two seats, PSA said. The French state and Dongfeng will also each have two seats. Dongfeng's board members will be Xu Ping and Liu Weidong, respectively the Chinese group's chairman and deputy general manager. Jean-Philippe Peugeot will leave the board and become a non-voting adviser, while Thierry's sister Marie-Helene Roncoroni will step down from the board. Gallois edged out former Nexans CEO Gerard Hauser, a former board member at PSA-controlled Faurecia, for the post, a source said. Gallois' track record "is quite good with regards to his performance at his former employers," said Sascha Gommel, a Frankfurt-based analyst at Commerzbank. "He is well aware of the needs of PSA in terms of investing not in France, not in Europe, but rather elsewhere. He might help to get the message across to the government." Florent Couvreur, a Paris-based analyst at CM-CIC Securities, said: "It's a very good choice, as he's always done a good job in all the positions he's had in the past. Now, everybody wonders whether he will be independent or not, knowing that he's been working for state-owned or state-controlled companies his whole life." Gallois ran Airbus, formerly called European Aeronautic, Defence & Space Co., for almost six years until May 2012. He published a report in 2012 on France's business competitiveness commissioned by Hollande. A graduate from France's elite Ecole Nationale d'Administration school for civil servants and the HEC business school, Gallois started his career at the French Treasury before holding several positions in the Socialist-led government in the early 1980s. As PSA's new chairman, Gallois will work with Carlos Tavares, who will replace Philippe Varin as chief executive officer on March 31. PSA announced on Feb. 19 that it had reached an agreement with France and Dongfeng under which they would each contribute about half the money for the planned 3 billion-euro capital increase in exchange for their stakes. The founding family's ownership in the carmaker will drop to 14 percent from the current 25.5 percent. The signing of the agreements is scheduled for March 26. The change of chairman is part of the deal's terms. The reorganization brings to an end the Peugeot family's control of the 118-year-old carmaker, which was unable to keep up with rivals as the automotive industry shifted from a regional focus to large worldwide players. "We have long been critical of the family's involvement in the business," London-based ISI Group analyst Erich Hauser said. "Seeing the family lose influence over the board is a step in the right direction. The big question is whether three equally large shareholders will find it easier to control Peugeot than one family did." PSA has been forced to slash costs as Europe's auto market declined for six straight years and currently spends 1-to-2 percentage points less on r&d than the industry average. The company reported a 177 million-euro operating loss in 2013, its second unprofitable year in a row.